Mouth-watering, rich Beef flavour your feline friend craves. No artificial flavours. 100% nutritionally complete. TEMPTATIONS® Hearty Beef is rated5.0 out of5 by26. Rated 5 out of5 byManick12 fromAmazing treatMy kitten, Hope, is five months and absolutely love these treats...I only have to take the bag off the shelf and she immediately knows what's coming her way. No matter where she is in the house...once she hears me taking out the Temptation treat bag she simply FLIES over to me. Odd due to the fact I sometimes call her in a loud voice looking for her and she apparently doesn't here THAT!! LOL She will even do tricks for them and once eaten, she's this happy go lucky energetic cat. I would like to add that I did not receive any incentive by writing this review. I would love coupons but if not....it's my pleasure to tell the truth. Rated 5 out of5 byAllah fromAwsome treatsTemptations are the best treats ever! My cat will eat NO other treat and will do tricks like a dog catch the treats in her paws and eat it out of her paw like a hand its just amazing! Now for 3 or more weeks we have been unable to buy any in wasaga beach and shes loosing her poor kitty mind!! Why? Where have they gone? Are they gonnz be back anytime soon? My poor kitty she NEEDS her treat time! Rated 5 out of5 byJess fromCats are crazy for these!I buy these regularly for my two cats, and the beef is definitely their favourite flavor. They always seem to know when I've brought home a fresh package, as evidenced by their nosing around in my shopping bags until they find their treats! I've tried other cat treat brands, but these ones are the only ones I buy now because they're clearly my cat's favourite. Rated 5 out of5 byJudy fromSpoiled catsWe always buy Temptations for our 3 cats. The other day at the pet store they had some treats on sale (regularly 6.99 on for 3.99) thought I'd give them a change. The dog is thoroughly enjoying them now as all 3 cats ranging from 3 to 13 yrs sniffed them and walked away. Lesson learned my cats know what they like. Rated 5 out of5 byLeanne0024 fromGreat stuffMy cats just love these ..I had to hide the bag in my room as I had it in the cupboard and my cat got them out an ripped the package apart lol....now as soon as they here the bag they come running , no matter where they are in the house ...thanks for the great product for my cats . Rated 5 out of5 bySkittles fromcat loves it!Skittles,now 15 years old has eaten Temptations her whole life. When she wants some see stands by the cupboard where we put them and waits for us to give them to her because she likes them so much. She likes several types and wants all day! Rated 5 out of5 byChristmas Carol fromIrresistible!Of all your flavours, my 6 cats all love this beefy one the Best! I cheat and use the container shake noise to call them all in for the night. Great product! Chicken By-product Meal, Ground Corn, Animal Fat (Preserved With Mixed Tocopherols), Dried Meat By-products, Brewers Rice, Wheat Flour, Natural Flavours, Grain Distillers Dried Yeast, Caramel Colour, Potassium Chloride, Choline Chloride, Salt, Taurine, Dl-methionine, Calcium Carbonate, Vitamins (Dl-alpha Tocopherol Acetate [source Of Vitamin E], Vitamin A Acetate, Niacin Supplement, Vitamin B12 Supplement, Riboflavin Supplement, Thiamine Mononitrate, D-calcium Pantothenate, Biotin, Vitamin D3 Supplement, Pyridoxine Hydrochloride [vitamin B6], Folic Acid), Minerals (Zinc Sulphate, Copper Sulphate, Manganese Sulphate, Potassium Iodide), Natural Beef Flavour, Mixed Tocopherols (A Natural Preservative), Dried Cheese. 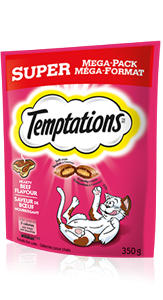 TEMPTATIONS® Hearty Beef Flavour Treats for cats is formulated to meet the nutritional levels established by the AAFCO Cat food Nutrient Profiles for all life stages. AAFCO stands for the Association of American Feed Control Officials. AAFCO develops standards for dog and cat nutrient profiles which are used as model regulations in the United States. AAFCO feeding protocols are referenced the ""Guide for the Labeling and Advertising of Pet Foods"" endorsed by the Competition Bureau of Canada as well as in the Guidelines for the Canadian Pet Food Industry, developed and administered by the Pet Food Association of Canada. These documents were created to help pet food manufacturers ensure that the food that they manufacture, distribution and sale of animal feeds are safe and of high quality.